Features: Easy to store, simple storage. LCD display: Time, speed, distance, heart rate, calorie, program Other function: MP3,Speaker, Bluetooth, APP, Auto lubrication system. Full dimension: 1785 x 844 x 1390mm/69.6 x 32.9 x 54.2inch(L X W X H) Package size: 170 x 760 x 330mm/6.6 x 29.6 x 12.8inch. 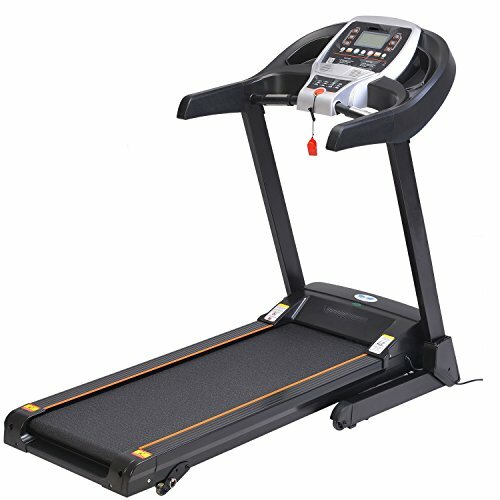 With the hydraulic spring easylift help, it is Simple to boost and lower your treadmill deck effortlessly. Designed for Versatility: For the overall walker, Jogger and Runner. Center of attention on cardio heart health while you figure out at faster speeds. This cardio equipment has a speed vary as much as 8.7 miles per hour. Commercial-Grade Treadmill Steel frame creates a robust structure. Top quality construction surpasses the fitness industry usual. Professional feel You can feel flexible and helps to keep each and every workout ok with strategically placed absorbers situated on every facet of your treadmill deck. LCD display: Time, speed, distance, heart rate, calorie, program. Other serve as: MP3,Speaker, Bluetooth, APP, Auto lubrication system. Running house: 1230 x 420mm/48.0 X 16.4inch. Full dimension: 1785 x 844 x 1390mm/69.6 x 32.9 x 54.2inch(L X W X H). Package size: 170 x 760 x 330mm/6.6 x 29.6 x 12.8inch. Occasion: Home, place of work, gym, ect. Package content: 1 x Treadmill. Features: Simple to store, easy storage. LCD display: Time, speed, distance, heart rate, calorie, program Other serve as: MP3,Speaker, Bluetooth, APP, Auto lubrication system. Occasion: Home, place of work, gymnasium. Effectively to burn your calories, beef up real-road condition, and spice up cardio staying power.